This topic describes how to set up Active Directory Federation Services (ADFS) as your identity provider by configuring SAML integration in both Pivotal Cloud Foundry (PCF) and ADFS. 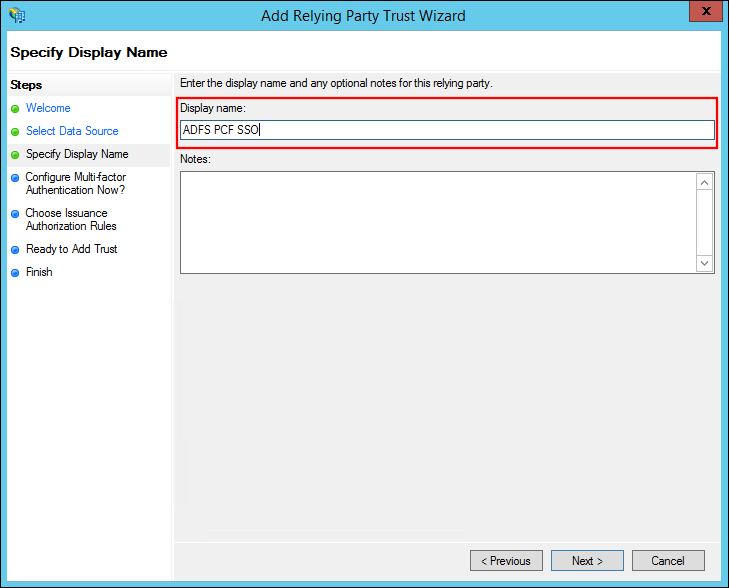 Click Add Relying Party Trust… in the Actions pane. On the Welcome step, click Start. Select Import data about the relying party from a file, enter the path to the downloaded service provider metadata, and click Next. Enter a name for Display name and click Next. Leave the default multi-factor authentication selection and click Next. Review your settings and click Next. Click Close to finish the wizard. 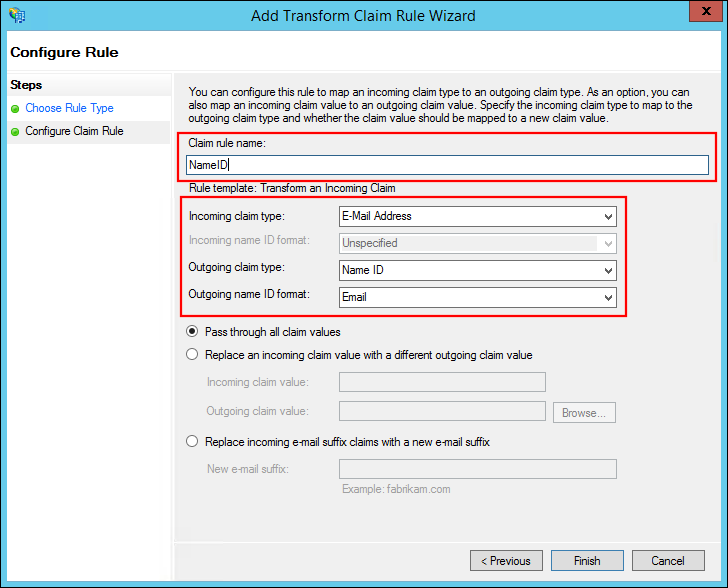 The claim rule editor should open by default. 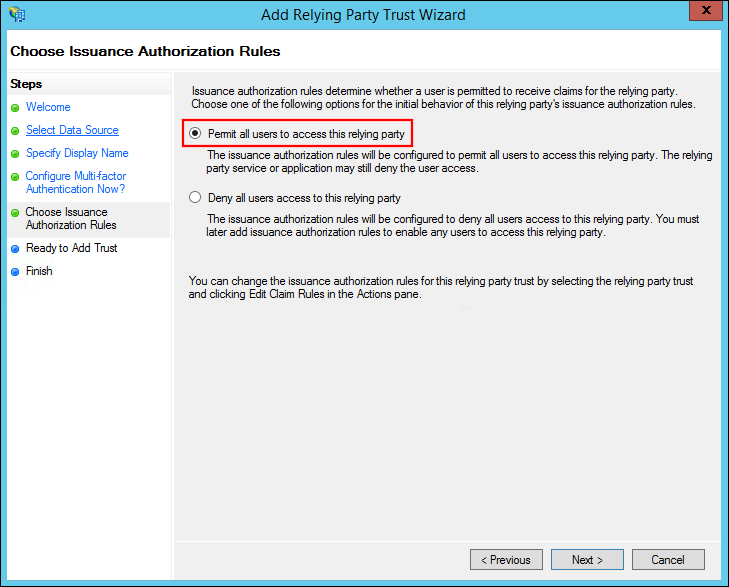 If it does not, select your Relying Party Trust and click Edit Claim Rules… in the Actions pane. 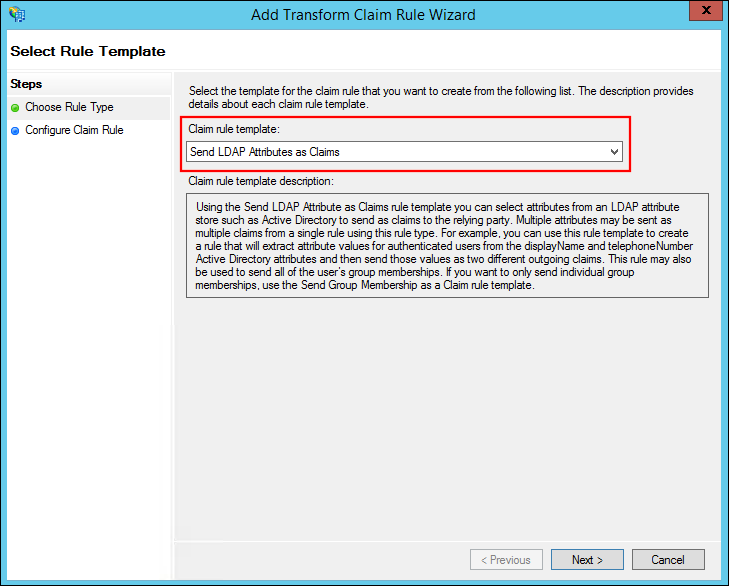 Select Send LDAP Attributes as Claims for Claim rule template and click Next. 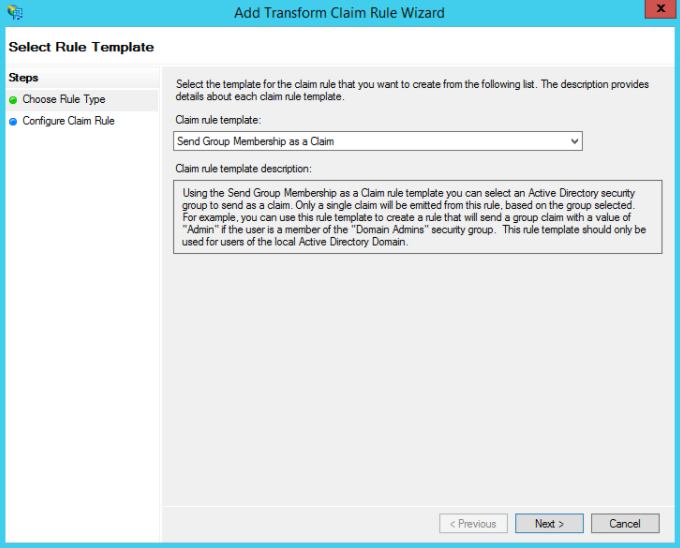 Enter a Claim rule name. Select Active Directory for Attribute store. 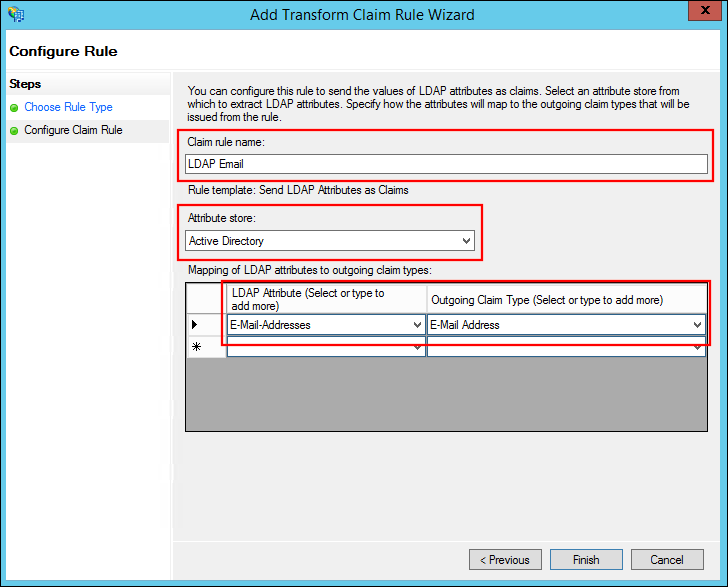 Select E-Mail-Addresses for LDAP Attribute and select E-mail Address for Outgoing Claim Type. 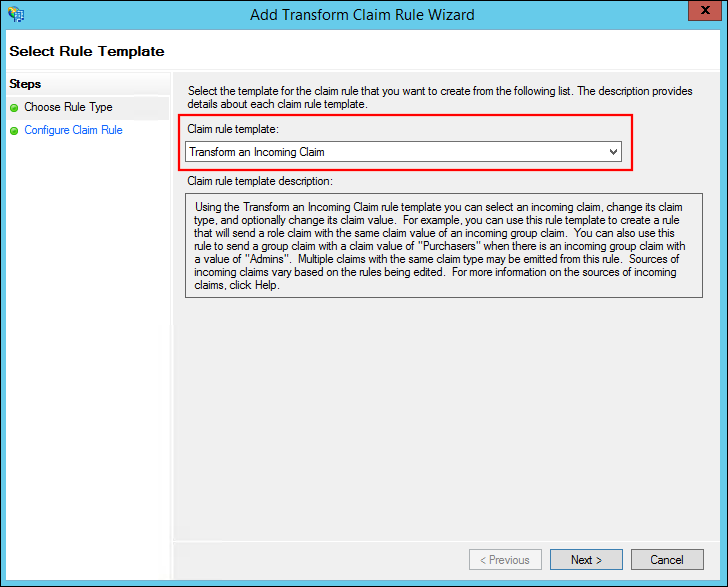 Select Transform an Incoming Claim for Claim rule template and click Next. 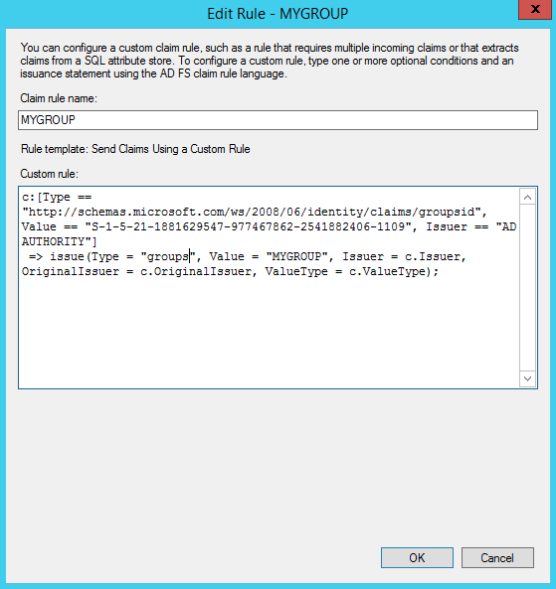 Select E-Mail Address for Incoming claim type. Select Email for Outgoing name ID format. 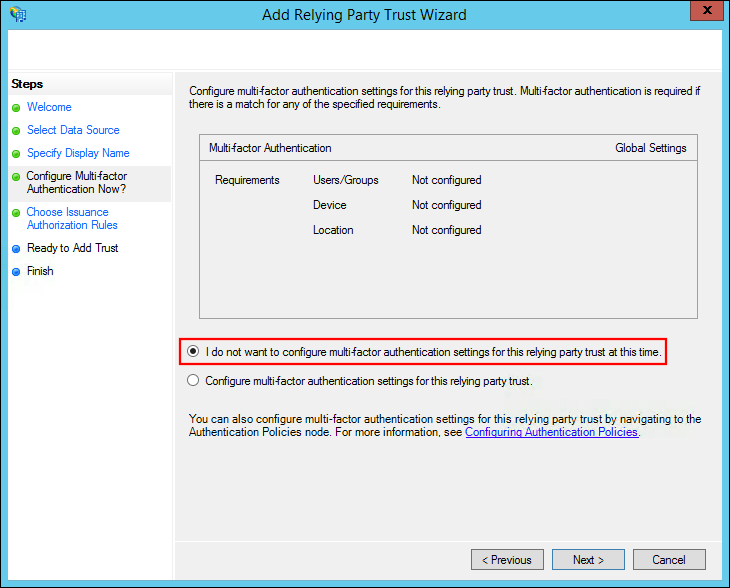 Double-click on the new Relying Party Trust to open the properties. 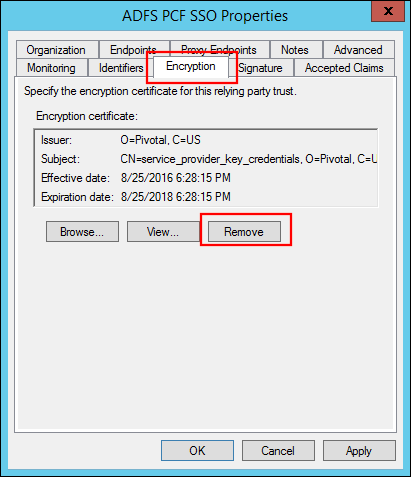 Select the Encryption tab and click Remove to remove the encryption certificate. 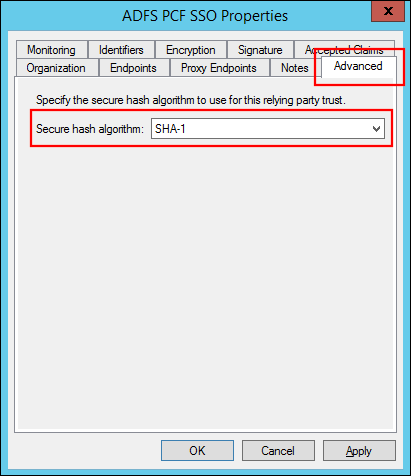 Select the Advanced tab and select the SHA algorithm for the Secure hash algorithm that matches the SHA Algorithm configured for Pivotal Application Service. (Optional) If you are using a self-signed certificate, add it to the ADFS trust store. Obtain the Ops Manager certificate from https://OPS_MANAGER_IP/api/v0/security/root_ca_certificate and add this CA certificate to the ADFS trust store, so ADFS can trust the “Service Provider Key Certificate” certificate signed by OpsManager ROOT CA. Note: Prior to PCF v1.10, steps 13 and 14 are required as all PCF components (including SSO tile) have certificates are signed by an internal CA. In PCF v1.10+, customers can upload their own CA certificate to PCF. (Optional) To specify any application or group attributes that you want to map to users in the ID token, click Edit Claim Rules… and configure Send LDAP Attributes as Claims. For more information, see the next section. 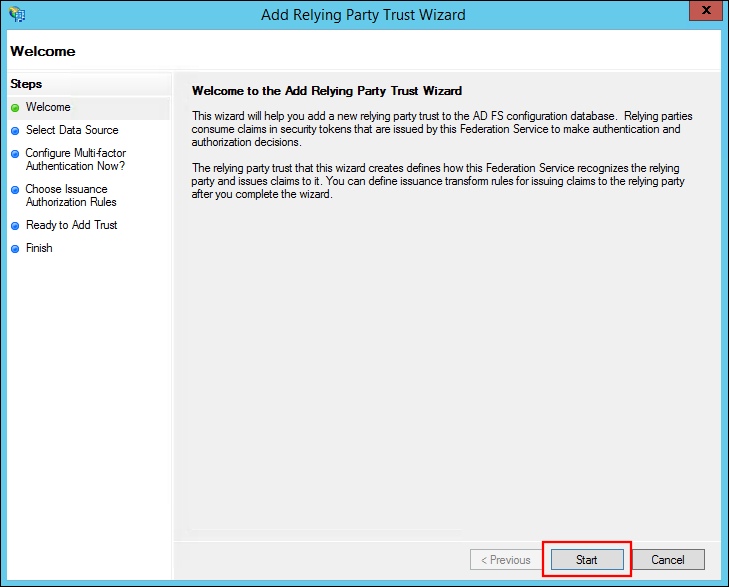 Right-click your Relying Party Trust and select Edit Claim Rules…. 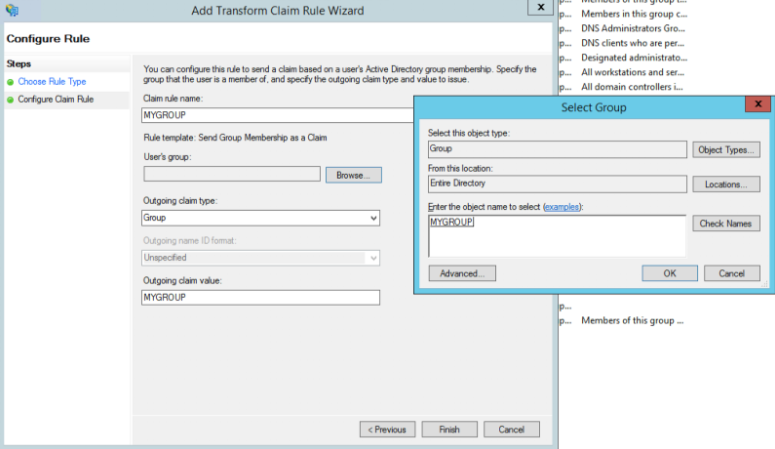 Select Send Group Membership as a Claim and click Next. Enter the Claim rule name. Click Browse to select your User’s group. 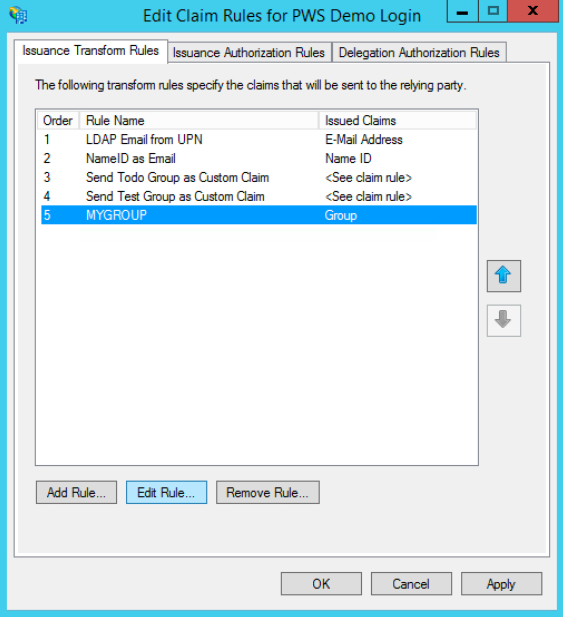 Select Group as your Outgoing claim type. Set your Outgoing claim value to match your group’s name. To save these configurations and use the default SAML assertion of http://schemas.xmlsoap.org/claims/Group, click OK. If you want to pass the claims assertion as a custom value “groups” in the SAML assertion, continue to the procedure below. Select your newly created rule and click Edit Rule. Copy the text in the Claim rule language field to a notepad or other location. You need this text for the next steps. Exit the Edit Rule menu. Select the rule you just added and click Remove Rule. 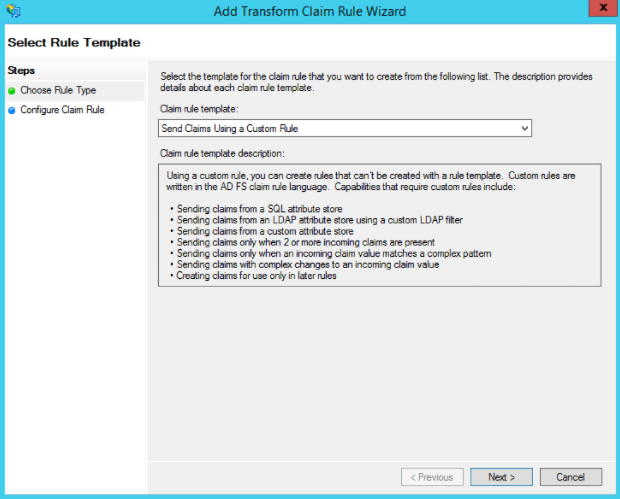 Select Send Claims Using a Custom Rule. Paste in the text you previously copied in step 3 from the removed rule. Edit the Type so that it only says “groups”. Click OK to finish making your changes and save the changes you made.